What is Encrypted Backup and why to Encrypt? Which Encryption standard does EdbMails use? Are the AES 256-bit encrypted backups, Incremental and compressed? To secure and protect your backup data, EdbMails Office 365 and Exchange Server Backup is encrypted with standard military grade AES 256-bit encryption. You can choose your own Private Encryption Key for additional protection or you can use the Default encryption provided by the application. EdbMails uses standard military grade AES 256-bit Encryption. You can choose your own Private Encryption Key for additional protection or you can use the Default encryption provided by the application. 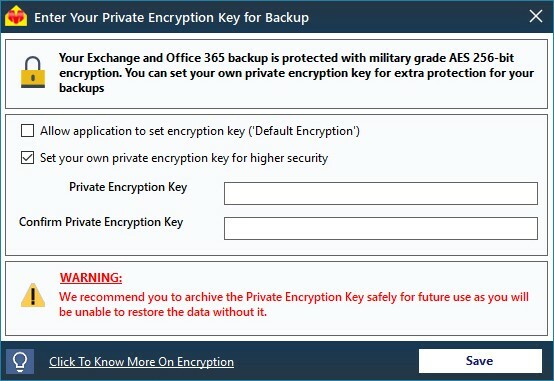 Office 365 and Live Exchange AES 256-bit encrypted backup is Incremental and Compressed? Yes. AES 256-bit encrypted backups are Incremental and compressed. This will save the disk space, bandwidth and performance of the backup will be improved. Note: It is important for you to archive the Private Encryption Key safely for future use as will be unable to restore the data without it. Initial backup is always full. That is, application will backup complete data from the selected mailbox on successful backup. Consecutive backup to the same location will be Incremental. That is, only the newly added (not yet considered for backup) items from the mailbox are considered for the backup by comparing the previous backup data. There by it will save the disk space, bandwidth and performance of the backup will be improved. Initial Migration is always full. That is, application will migrate complete data from the selected mailbox on successful Migration. Consecutive migration to the same location will be Incremental. That is, only the newly added (not yet considered for Migration) items from the mailbox are considered for the migration by comparing the previous migration data. There by it will avoid duplicate items, bandwidth and performance of the migration will be improved. 1. 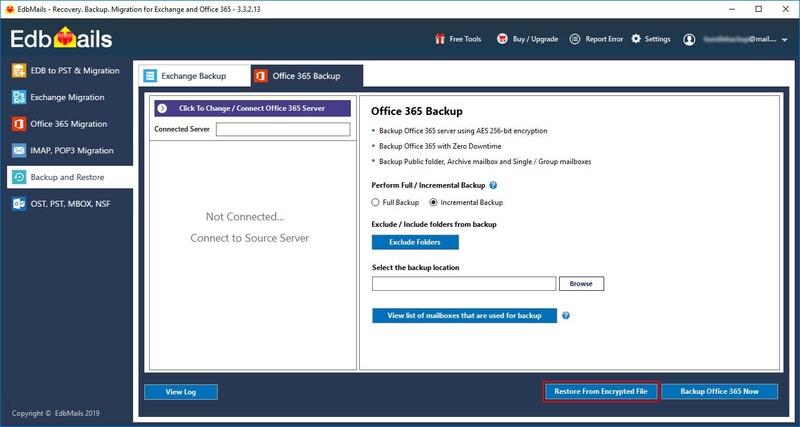 Click the ‘Restore’ button from the Office 365 / Exchange Backup screen as shown below. 3. Select the encrypted file that you wish to restore from the backup location and proceed.